An artist's depiction of the newly described object. A rogue, planet-size object 20 light-years away from Earth has stunned astronomers with its incredibly powerful magnetic field. The scientists found that the object's magnetic field is more than 200 times stronger than Jupiter's, which, in turn, is between 16 and 54 times stronger than Earth's, according to NASA. How the object, which scientists call SIMP J01365663+0933473, can maintain a magnetic field so strong, as well as generate spectacular auroras, is still unclear. And it's not just the magnetic mechanism that's leaving scientists with questions right now — there are plenty of other mysteries about the object, which scientists first discovered in 2016. The object is what scientists call a brown dwarf. Nicknamed "failed stars," brown dwarfs are larger than planets, but not quite large enough to fuse hydrogen, the way stars do. The boundary line is still debated, but scientists tend to draw it at about 13 times the mass of Jupiter. 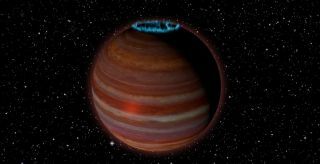 Originally, scientists thought SIMP J01365663+0933473 was a gigantic, old brown dwarf. But further study showed that it is instead relatively young, at 200 million years old, and is only 12.7 times the mass of Jupiter. That research also showed that the planet is on its own, not orbiting a star. "This object is right at the boundary between a planet and a brown dwarf, or 'failed star,' and is giving us some surprises that can potentially help us understand magnetic processes on both stars and planets," Kao said in the statement. "We think these mechanisms can work not only in brown dwarfs, but also in both gas giant and terrestrial planets." The team is particularly excited by the new research because it relies in part on radio observations of the object's auroras — which means that radio telescopes may be able to identify new planets by their auroras. The new research was described in an article published July 31 in the Astrophysical Journal.